This past winter break, several Hillsdale stu­dents attended the Forge Lead­ership Network in Wash­ington, D.C. The network pro­vides a venue for young adults ages 18 to 25 to gain a deeper under­standing of pol­itics, modern culture, and business through trainings, speakers, and career pre­paredness. 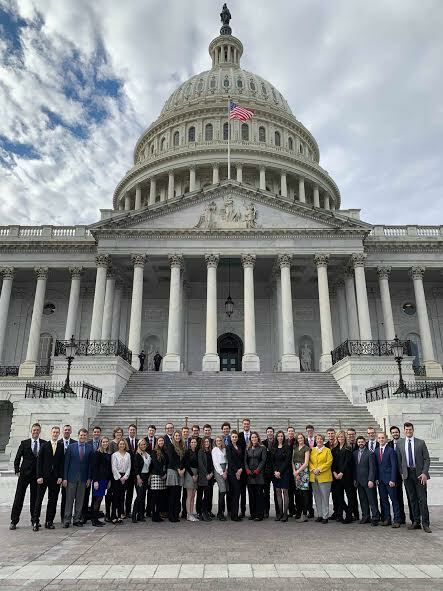 Several Hillsdale stu­dents have attended Forge Lead­ership summits over the years, including five attendees this past January 6 – 10. Lucy Meckler, Greg Bon­vissuto, Alexis Nester, Bryce Asberg, and Frank Vitale attended the Forge Academy, also known as Forge 201. Bon­vissuto said he appre­ciated hearing from all the dif­ferent speakers, par­tic­u­larly several Con­gressmen. Forge focuses on training stu­dents to make an impact across the culture, not just in reli­gious or con­ser­v­ative circles. Founded in 2015 by Adam Jose­fczyk and Justin Powell, the program attracts young con­ser­v­ative college stu­dents and grad­uates from across the United States. Bon­vissuto also learned about the Forge through the same dinner last year. He esti­mated that Forge 101 had about 80 to 90 par­tic­i­pants while Forge 201 had nearly half that number. “I’d say that I enjoyed the second program more because it was a smaller group,” Bon­vissuto said. A large portion of the 201 program is the men­torship aspect. Fol­lowing the week in D.C., Forge Fellows are paired with an older mentor in their field of study to assist them in finding intern­ships or jobs. Addi­tionally, they help teach mentees how to network and make lasting con­nec­tions in their respective field. Meckler applied and was accepted to the Forge 301 program which will give her the oppor­tunity to go to Israel with Pas­sages, a program spon­sored by the Philos Project and the Museum of the Bible Foun­dation. “I came away with a greater appre­ci­ation for the fact that a free society such as ours is incredibly complex,” Bon­vissuto said. All three par­tic­i­pants highly rec­ommend the program to Hillsdale stu­dents regardless of their major.